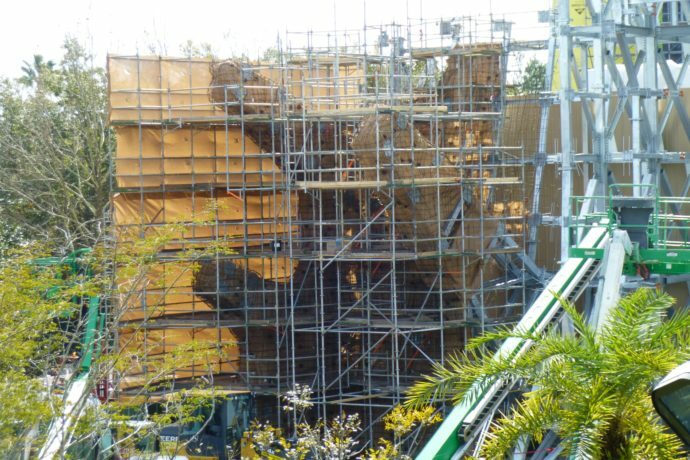 In checking in on the construction progress at the site of Project 340 in Islands of Adventure, it looks like rockwork for the facade is about to be applied. The steel skeleton has been wrapped in some sort of cloth and then a wire mesh that resembles a tough chicken-wire, to maintain its shape. In addition to the huge facade, a two-dimensional cutout of what looks like rough rocks has been added behind the gate to block the view of top of the show building. This flat piece is being wrapped in weather-proof materials in preparation for its forthcoming aesthetic covering. Check out today’s Construction photo report below and be sure to subscribe for more updates! The view of the site over the fence. Note: all images taken from guest areas. The building starts on the left and can be seen stretching all the way to the right of the photo. Coming upon this area will be breathtaking when complete.